The Saleforce UI displays 15 digit, case-sensitive IDs for records. However, for Windows machines you will need to use a case-safe version of the ID for data migration, API calls and such. It's not hard to generate these 18 digits IDs but it does take some time. I've been working on a lot of Google Gadgets and Chrome extensions lately so I thought I would throw together a Chrome extension (sorry Firefox users!) 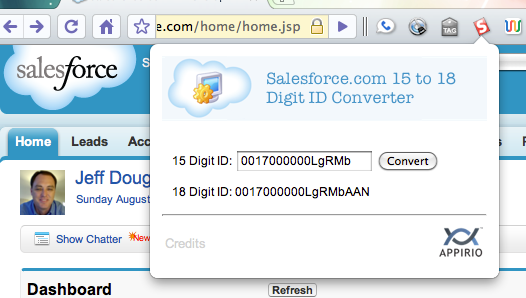 to quickly generated an 18 digit Salesforce.com ID. Thanks to Ron Hess for the conversion script! Please let me know if you have any issues, bugs or feedback.